After being a highly successful life form for 250 million years, disruptions in the biological and communication systems of coral reefs due to coral bleaching have been found to be the underlying cause of theand collapse of reef ecosystems around the world. Coral reefs form the world's biggest single structure made by living organisms, Australia's Great Barrier Reef, which is visible from outer space. The reef is composed of over 2,900 individual reefs and 900 islands stretching for over 3,000 kilometers over an area of approximately 344,400 square kilometers. An international team of researchers reports that coral populations which unexpectedly survived a massive bleaching event in 2010 in South-East Asian waters had previously experienced severe bleaching during an event in 1998. The team analysed what happened at three sites during the 2010 event and found that in Indonesia, corals responded to higher sea temperatures in a typical way, with fast-growing branching species – such as staghorn corals – suffering severe die-offs. But at sites monitored in Singapore and Malaysia, the usual trend was reversed: normally susceptible colonies of fast-growing Acropora corals appeared healthy and fully pigmented, while most colonies of massive coral were severely bleached. Mass coral-bleaching events, caused by a breakdown in the relationship between the coral animals and their symbiotic algae, are strongly correlated with unusually high sea temperatures and have led to widespread reef degradation in recent decades," notes lead author Dr James Guest, currently a joint research fellow at the UNSW Centre for Marine Bio-innovation and the Advanced Environmental Biotechnology Centre at Singapore's Nanyang Technological University. The severity of these events varies considerably but until now we've seen one consistent trend: certain types of coral tend to be more resistant to bleaching than others. This has led to the prediction that hardier, slow-growing massive species will replace less hardy, fast-growing branching species on reefs in the future. But during the 2010 event the normal hierarchy of species susceptibility was reversed in some places. Corals at our Indonesian study site in Pulau Weh, Sumatra, followed the usual pattern, with around 90% of colonies of fast-growing species dying. But the pattern was the opposite at study sites in Singapore and Malaysia, even though sea-temperature data showed that the magnitude of thermal stress was similar at all sites. This suggests that the thermal history of these sites may have played an important role in determining the bleaching severity in 2010. When we looked at archived sea-surface temperature data and past bleaching records we found that the locations that had a reversed hierarchy of susceptibility and less severe bleaching in 2010 also bleached during 1998. In contrast, the site that had a normal bleaching hierarchy and severe bleaching did not bleach in 1998. The most parsimonious explanation, therefore, is that coral populations that bleached during the last major warming event in 1998 have adapted and/or acclimatised to thermal stress. This is controversial because many scientists believe that corals have exhausted their capacity to adapt to thermal stress." While these results are encouraging, Dr Guest says, it does not necessarily mean that the global threat to reefs has lessened. There are likely to be limits to thermal adaptation and acclimatisation, and there may be other costs to the corals, such as reduced growth and reproductive health. 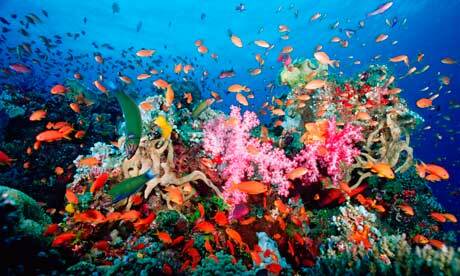 As well, reefs continue to be threatened by overfishing, pollution, diseases and ocean acidification. The results of the present study do indicate, however, that the effects of coral bleaching will not be as uniform as previously thought and fast-growing branching taxa such as Acropora and Pocillopora are likely to persist in some locations despite increases in the frequency of thermal stress events.